Growing up in a town in Northern Jersey just a stone’s throw from Manhattan back in the 60’s and 70’s, soccer or futbal as it continues to be called by some passionate advocates had scarcely taken hold. The rage on the sporting front was baseball, American football and basketball in that order. The closest game to soccer in concept and execution was ice hockey which placed fourth in order of popularity. As the once prohibitively Italian-American town’s ethnicity re-defined itself starting in the late 80’s, the world’s most popular sport began to take hold. Decades later the community is 85% Hispanic and soccer has effectively become the town’s game of choice by a wide margin. Baseball and American football leagues once thriving have long disbanded and the one specious field, designed for the community’s Babe Ruth League is now a lighted soccer field in operation every day from the time school closes till 10:00 and on the weekend from early morning till late at night. 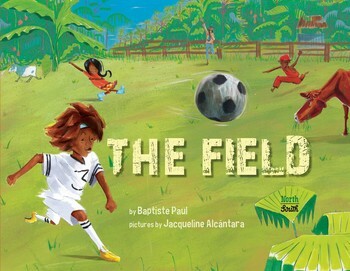 Soccer is now all the rage much as it is in one 2018’s most infectious and immersive picture books, The Field by Baptiste Paul, with illustrations by Jacqueline Alcantara. The latter’s exotic front cover, a lush olive green tapestry showing the game’s all-encompassing allure to young and old, replicated on the dust jacket is in the humble opinion of this reviewer the most exquisite of the hundreds of picture books released this past year. And there have been a number of front cover gems to be sure. 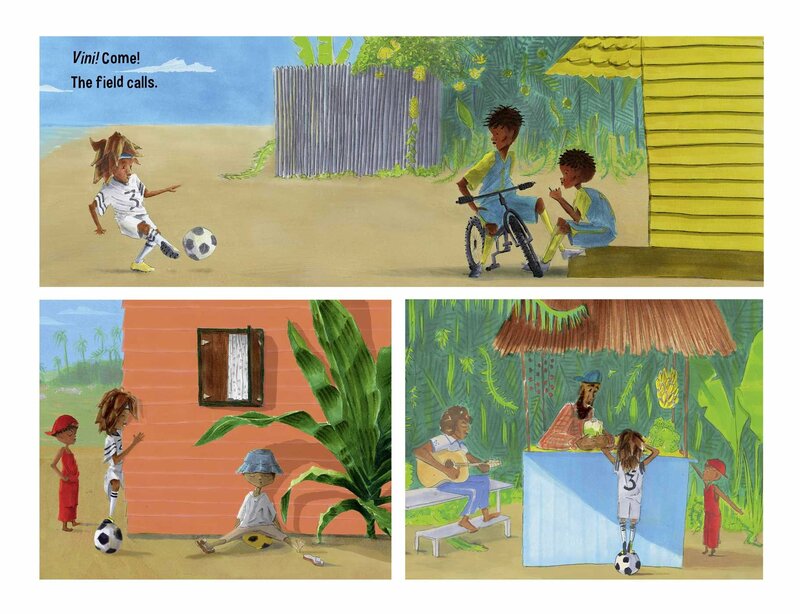 The front end papers accentuate soccer’s hold on St. Lucia on the Domenican Islands where the game spills over from a cow field to an adjoining forest. Alcantara’s sumptuous color blends bring this exotic locale into the classroom or home where The Field is being read and each of the illustrations in the book whether they are vignette style, full page or double page canvases they are vibrant and bursting with energy. Paul effectively integrates the Creole language, which is this area of the world is heavily French based with some Spanish, Portuguese and English, by placing Creole next to English in the text throughout. At the outset a take charge youth wearing white who was first seen in prominent form on the cover make his rounds to recruit players. Some Creole to English similarities are noted earlier on in a full page where the organizer and his recruits commence practicing. Bol = Ball. Soulye = Shoes. Goal = Goal. And then on the following page -a double page spread- Ou Ou Ou. You. You You as sides are designated by the referee, formerly the proprietor of the juice and banana stand. One boy shoos off the cows to clear the field and none of those evicted seem pleased. The game is played frantically with instructions and orders coming off as a kind of voice annotation. The player in white (No. 3) is depicted gliding across along with the red-shirted and capped cow chaser but then as is usually always the case in this region -one of the rainiest on the planet- rain falls, coaxing one woman to assumed it is game over. Paul assesses the scene superbly: Shutters band. Sun hides. Clay dust stings. Sky falls. Nonetheless the game’s indomitable adherents have no intentions to retire (“No Way!”) and they dash, slip-slide and belly flop in a ravishing canvas that may reminds some viewers of a corresponding scene in Float by Daniel Miyares, but in The Field, it is clear that recreation has a far more resonating claim on people’s lives. The rain soaked tapestry is one of Alcantara’s finest as it the encore depicting how the mud wrecks further havoc and causes one player to ask another Ou byen? You okay? The response -Mweb byen. I’m good makes it abundantly clear that this scenario has played out many times with this fearless muckrakers. Even the tall and skinny referee refuses to compromises his significance, and will blow his whistles so his charges can regroup. But while rain is a constant so it it stopping in short order so that the sun can make another appearance, brighter and hotter than ever. Rain stops. Sun peaks. After Paul declares One last drive. Dribble, twist…we behold the dragged out word so famous in soccer broadcasts, GOOOOOOOOOOOOOOAL!!!!!!!! As a kid growing up, I did not have electricity, running water or many toys. What I did have plenty of were siblings -nine of them- and lots of friends. Most of my free time was spent on a futbol (soccer) field playing, learning new techniques, and occasionally getting bruised. When I see my own children run outside to play, it reminds me of my childhood. A helpful Creole to English glossary is offered on the final end papers with the aforementioned author’s note. You’d almost think that Alcantara’s brilliant and colorful art is comparable to what one would see from a camera lens. But the illustrations in The Field are even better. They capture motion, temperature, immersion with the elements and spontaneity and consummate Paul’s vision of a soccer-mad place where children learn so much about perseverance, commitment, camaraderie and teamwork through their singular obsession. 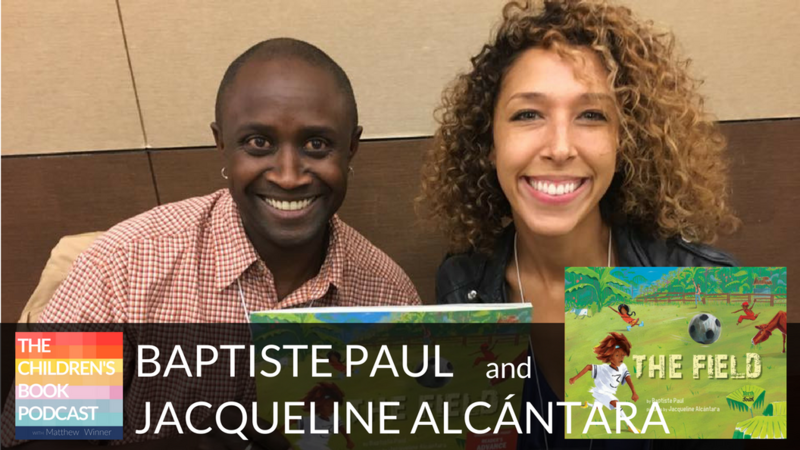 In just one day the Caldecott committee will reveal their winners for 2018 picture books, and Alcantara’s stunning art should be given a very hard look. 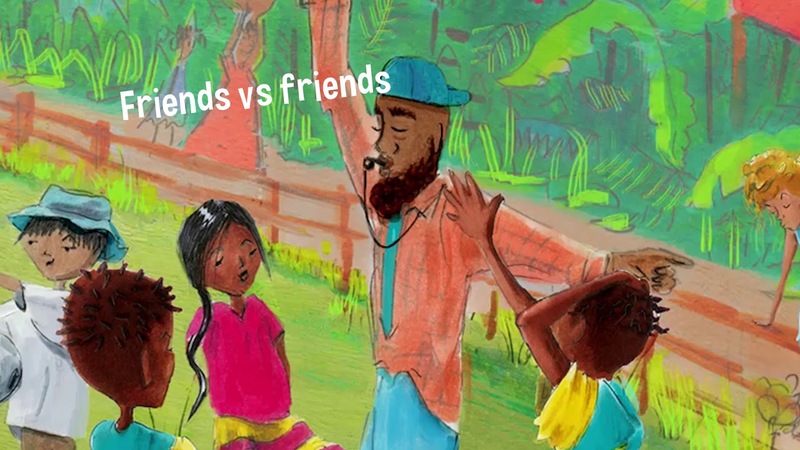 Note: This is the twenty-eighth and final entry in the 2018 Caldecott Medal Contender series. The annual venture does not purport to predict what the committee will choose, rather it attempts to gauge what the writer feels should be in the running. In most instances the books that are featured in the series have been touted as contenders in various online round-ups, but for the ones that are not, the inclusions are a humble plea to the committee for consideration. It is anticipated the series will include in the neighborhood of around 25 titles; the order which they are being presented in is arbitrary, as every book in this series is a contender. Some of my top favorites of the lot will be done near the end. The awards will be announced in late January, hence the reviews will continue until around the middle of that month. One of the most exquisite sports-themed picture books ever, and your fascinated account and lead-in had me enthralled Sam! That cover really grabbed me when I first saw the book. I subsequently loved it more and more. Your final review is fantastic Sammy, as was your entire series. I know The Field didn’t win anything but I can say it is a huge library favorite. Vivid and full of energy, in addition to those rapturous colors. I too have seen the change over in Bergen and Hudson County communities. But it is wonderful thing to behold this passion for sport. The art is stunning and again you’ve written with love and insight, Sam. Last but not least as they say.